This journey starts in Lhasa, with our introduction to the rich history of Tibetan Buddhism, a chance to see the former homes of the Dalai Lama and some of the iconic and historical sights there. From Lhasa we travel to Everest Base Camp via Rongbuk and some amazingly scenic places. We have a chance to see this barren place as well as a host of huge peaks of the Himalayas including Mt Everest the world’s highest peak. 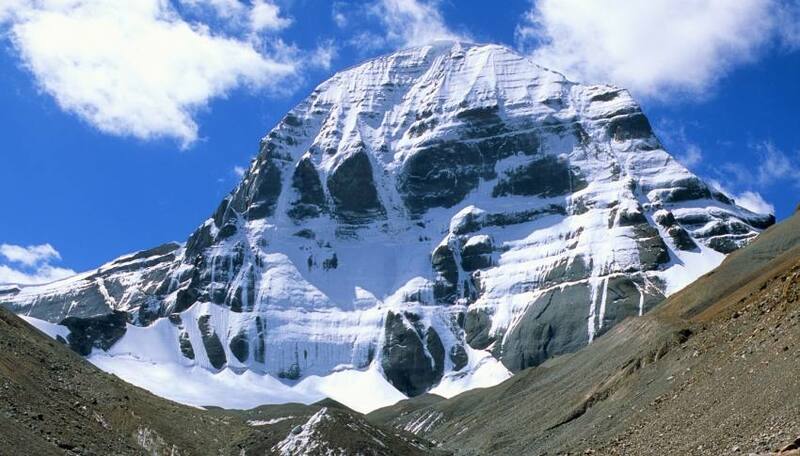 Our journey ends with a visit to Mount Kailash and Lake Manasarovar two of the most sacred places on earth. Mount Kailash, located in a remote part of western Tibet is more than just a majestic mountain, it’s a legend. One of the most important spiritual pilgrimage sites in the world this is a journey that is as much an inward one as an outward one. Revered by millions of people from different religions it si a life changing experience for the few thousand pilgrims who undertake the journey each year. According to Hindus it is the abode of Lord Shiva, the holy centre of the earth and the manifestation of heaven itself. To the Tibetan Buddhists Mount Kailash is the home of Buddha Demchok who symbolizes supreme harmony. The Tibetan Bon religion believes Mount Kailash is their spiritual seat of power and in Jainism Kailash (known as Mount Ashtapada) is the place where the creator of their faith, Rishabhadeva attained freedom from the cycle of life and rebirth. 20km from Mount Kailash Lake Manasarovar is part of this sacred pilgrimage route. Bathing in or drinking the water from Lake Manasarovar is thought to cleanse one of all sins and this is the first stop for pilgrims. It is said that one trip around the sacred mountain will wipe away all the sins (bad karma) of one's current lifetime, 108 revolutions will remove the sins of all one's lifetimes and bring salvation from reincarnation (moksa). Alternatively, pilgrims who complete one circumbulation of Kailash and bathe in the frigid waters of Lake Manasarovar will also bring salvation. Day 7Rongbuk to Tingri 4200m / 13,780ft) via Everest Base Camp 5-6 hours Leaving Rongbuk this morning we enjoy the spectacular views of the mountains such as Cho Oyu (8201m), Shishipangma (8013m) and Mt Everest (8848m) all among the highest in the world. Mt Everest, known at Chomolungma in Tibetan being the tallest peak in the world. After spending time at the barren base camp surrounded by enormous peaks we continue on our journey to Tingri. Overnight in Tingri. Day 9Saga to Manasarovar (4558m/14,954ft) 6-7 hrs It’s an exciting day today as we will get our first glimpse of Mt Kailash. Our destination is Lake Manasarovar where we can have a dip in the sacred waters. The sacred blue and emerald green Manasarovar Lake is known to be an epitome of purity, containing healing properties and the power to wash off all mortal sins. Overnight in Manasarovar. Day 10Lake Manasarovar This morning we will enjoy puja on the lake and to bathe in the holy lake. We will enjoy some time by the lake including a picnic lunch before driving to Darchen where we will stay overnight. Day 11Drive to Tarboche then trek to Drirapuk (5000m/16,404ft) 6-8 hours Today marks the start of our trek around the sacred mountain. We walk 18km today through the valley with the river on our left and Mount Kailash on our right. Be prepared for some incredible views of Mount Kailash and a feeling that cannot be described but needs to be felt personally. The first day of our Kora is a gradual walk along with many other pilgrims chanting and praying. Overnight at Drirapuk in guesthouse or tents. Day 12Drirapuk to Dolma La Pass (5944m/19,500ft) to Zuthulphuk 10-12 hrs Today is the hardest day of our journey but also the most rewarding. Our way today leads us to the much higher path just beneath Mount Kailash and is one of the highest points on our trip. At the pass there is a large boulder festooned with prayer flags, just below the pass is Lake Tuje Chenpo Dzingbu (Gauri Kund) otherwise known as the “Pool of Great Compassion”. From here we descending gradually over grassy fields towards Zuthulphuk, the miracle cave of Milarepa where we stay overnight. Day 13Zuthulphuk – Darchen then drive to Lake Manasarovar This morning we can spend some time exploring the caves and visiting the temples and shrine that has been built around Milarepa’s Cave. It is well worth the climb up to these caves before continuing on the final leg of our pilgrimage Kora on a gradually winding track which finishes in Darchen. From here we drive back to Lake Manasorovar where we spend the night. Day 14Lake Manasarovar drive to Saga Now we begin our return journey with a drive to Saga. Overnight in Saga. Day 15Saga to Kathmandu 6-8 hrs The final day of our journey takes us back to Kathmandu and the end of our journey. Day 16Departure Day It’s time for our journey to end. You will be escorted to the airport for your international flight or onward journey.